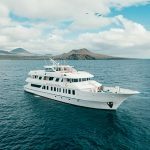 Peregrine Adventures’ first custom-built expedition vessel has begun cruising the Galapagos as part of the company’s burgeoning small-ship Adventure Cruising program which has grown 35 per cent year to date. One of the newest and most sustainable ships operating in the Galapagos, Grand Queen Beatriz, named after the matriarch of the Galapagueno family who built and own the vessel, departed on her maiden voyage from Puerto Baquerizo Morena in San Cristobal on Saturday July 1. The 30-metre vessel has been designed with comfort and space in mind. The ship’s nine cabins have outward-facing windows, ensuite bathrooms, are on average double the size of similar accommodation found on other boats in the region and are spread over three decks with separate communal areas, offering extra privacy and space. 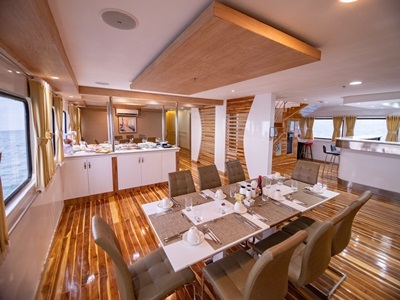 The 300-tonne boat is also home to a dining room, two bars, lounge and TV area, and a sun deck with a jacuzzi. The upper deck boasts private balcony rooms. Filippos Venetopoulos, Peregrine’s Adventure Cruising general manager, says Queen Bea, as she has become known, was launched in response to demand from environmentally-conscious travellers in the region. Grand Queen Beatriz is offering a combination of six, 10, 13 and 17-day Galapagos itineraries departing from Quito with the six-day Galapagos Encounter Central Islands priced from $3491* per person twin share. The vessel will also offer Peregrine’s new action-packed 13-day Treasures of the Galapagos – Western & Central Islands, which offers great opportunities for wildlife viewing and interaction. With the itineraries designed for environmentally-conscious travellers and more mindful explorers, Peregrine only charters small ships with capacity for 50 or less travellers, which can call at smaller ports that large cruise ships can’t access. All trips are accompanied by Peregrine Adventures’ local leaders and include onboard kayaks, all transfers and excursions, as well as most meals. Peregrine will continue to carbon offset all trips through a range of renewable energy projects.